In “A Model for Clinical Informatics Education for Residents: Addressing an Unmet Need” Mai et al describe an interesting model for residents to participate and engage in Clinical Informatics Education at the Children's Hospital of Philadelphia, through rotations organized by the Department of Health Informatics (DHI), with hands-on project experience, led by faculty mentors. Not only did the program lead to the improvement of information systems in the organization, but also to the emergence of new champions and educators, which eventually motivated several physicians in residency to pursue a subspecialty in clinical informatics. Latin America boasts three health resident informaticist programs, i.e., Hospital das Clínicas da Faculdade de Medicina da Universidade de São Paulo (HCFMUSP) (1988–1997) in Brazil, and two in the city Buenos Aires, Argentina—Hospital Italiano de Buenos Aires (HIBA) (2001 to date) and Ministry of Health (2017 to date), based on the hands-on training design of HIBA. Founded in 1853, HIBA has been a university teaching hospital since 2000, accredited as an academic medical center hospital by the Joint Commission International in 2015. HIBA residency programs date back to 1962, there currently being more than 400 residents across 41 specialties and 120 subspecialties. When the Clinical Informatics Residency was launched in 2001, the applicants to this training program were physicians participating in the development of HIBÁs proprietary health information system (HIS). HIS was developed as the specialty progressed. Nurses were gradually incorporated and in the end the program became an interdisciplinary residency, annually enrolling five health care physicians and social sciences professionals, on the understanding that information systems pose challenges that only a multiskilled team can address. Applicants to the 3-year training program are now required to have at least 1-year practice and clinical experience in health care organizations. The HIBA DHI (with 160 information technology [IT] practitioners among faculty members) is responsible for the academic development of trainees. Residents gain exposure and training in the fields of clinical informatics (IT project management and organizational change), HIS (electronic health records [EHR], interoperability, standards, clinical decision support systems, safety, and privacy), and software development (software engineering, usability, databases, and programming logic). All teaching contents follow the recommendations laid down by the American Medical Informatics Association (AMIA) and the International Medical Informatics Association (IMIA). Each resident manages an HIS portfolio under the mentorship of one of the 10 certified clinical informaticists of the DHI, harnessing theory and practice to advance HIS development and implementation. On one hand, residents bridge the gap between the different players in the HIBA health care system and HIS developers by defining information needs, use cases, information flows, and adequate data for different professionals. They also develop customized interfaces to meet HIBA needs, follow-up on the data cycle across the whole organization (quality and efficiency management, assistance, education, and research). On the other hand, trainees contribute to the integration of projects and initiatives into a comprehensive standard-based information system, and also facilitate the interaction between the IT implementation teams and care professionals. Last but not least, residents engage in research projects and impact on the assessment of DHI innovations which are communicated in regional and international fora and in numerous clinical informatics training activities at undergraduate and graduate levels. Since the inception of the program more than 15 years ago, 41 residents have graduated—10 of them are currently clinical informaticians at HIBA, another 10 are devoted to EHR development and implementation at ministries of health under federal, provincial (province of Buenos Aires), and local governments (city of Buenos Aires). Four graduates have pursued careers in this discipline in provincial health organizations. Thirteen work at private hospitals in the city of Buenos Aires. Further, four of them are talented professionals abroad—one in a leading private hospital in Chile, two as consultants in a major multinational corporation engaged in HIS sales in the region, and the fourth holds a teaching position at the University of Utah. In Brazil, since it was founded in 1944, HCFMUSP, a state-owned hospital, has become the leading Brazilian center of excellence in terms of health care, education, and research. A postgraduate school, Faculdade de Medicina da Universidade de São Paulo, has 1,700 residents in 42 specialties. In the 1988 to 1997 period, the Clinical Pathology Service started a clinical informatics residency, a 2-year training program in a hospital and outpatient environment. 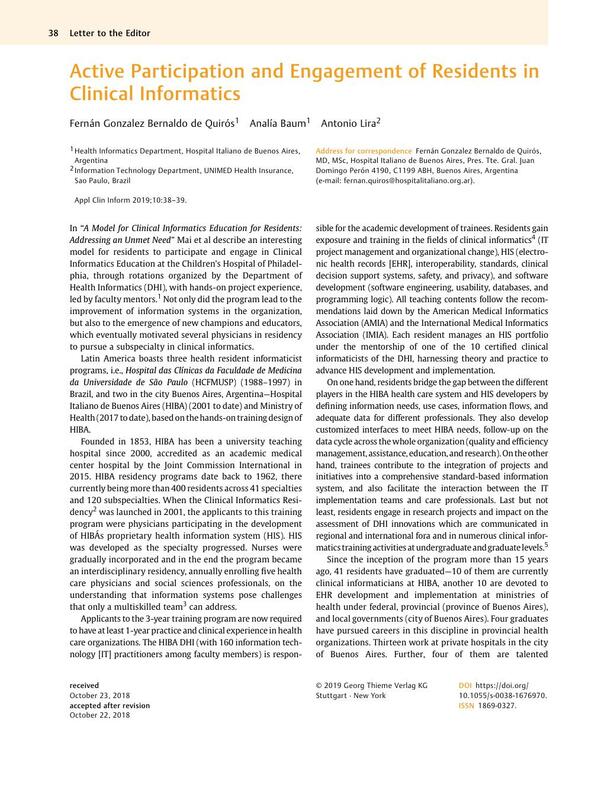 Its main focus being hospital software project management, the design of EHR, and epidemiological IT tools, the São Paulo model resulted in a pioneering experience which systematized some of the topics in the discipline of clinical informatics education. In 10 years' time, 20 physicians became leaders in this novel field not only in Brazil but also worldwide. Indeed, residency programs are a valuable training choice, adding value to the design, development, and implementation of health care applications, geared toward health care efficiency and quality. Resident participation results in IT systems focused on care workflows. As in the Pittsburgh case, the HIS program has been highly welcomed at HIBA, in part due to the skills acquired during the learning process. Also highly commendable is the performance of our graduates as HIS project leaders in the region. Thus, to put it briefly, a proprietary HIS, a residency training program, and a multidisciplinary team translate into an efficiently trained health IT workforce across the organization. No data from human subjects were involved in this project therefore it was exempted from institutional review board approval.